Scotland's preparation has been all about winning their Nations league group and cementing a play-off place for Euro 2020, says James McFadden. Should the Scots finish ahead of Albania and Israel they could be just two games away from qualification for their first major finals since 1998. "We're favourites to win the group," said assistant manager McFadden. "It gives you the chance of qualification for Euro 2020, so of course we'll be taking it seriously." Scotland begin the inaugural Nations League on Monday at home to Albania, but before that they face World Cup semi-finalists Belgium in a friendly on Friday evening. With Liverpool's Andy Robertson named as the new Scotland captain, it appears he has won the battle with Celtic's Kieran Tierney for the left-back spot. 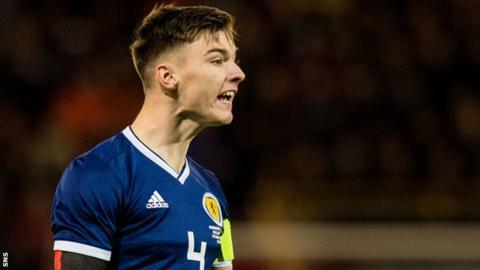 However, McFadden says Scotland are blessed with two of the best left-backs in the world, and insists he and Alex McLeish will still try to accommodate the 21-year-old Tierney. He told BBC Sport: "It's a strange problem, but it's a nice problem to have. You want to have the best players available to you. "We'll just need to find a way to fit them in the side. We feel as if we'll be able to do that, without sacrificing Kieran too much. It's not a problem, it's a nice headache to have." He added: "He [Robertson] is a dream. He was a natural choice for the captaincy. His enthusiasm, the way he is about the group - and he challenges you as well. He's not afraid to voice his opinion. "That's exactly what you need, but he also wants what's best for the team. "Andy's had to work hard for where he is now. He takes nothing for granted. He's played in the Champions League final. He's absolutely flying. "He's so humble, the players look up to him. And he's a leader."